KIM BROWN:	Welcome to The Real News Network, in Baltimore. I’m Kim Brown. On Thursday morning, there were local law enforcement from North Dakota, as well as federal agents and members of the U.S. Army Corps of Engineers, moving into the Standing Rock camp, to evict the remaining people who were there protesting the construction of the Dakota Access Pipeline. And as we have seen in previous encounters between protesters and law enforcement, some of these clashes have been violent, but that has not been reported to us, so far here on Thursday morning. We’re going live right now to Jihan Hafiz. She is an independent journalist. She is at the Standing Rock camp, as these evictions are happening with law enforcement pretty much surrounding the area. So, Jihan, give us an idea, what are you seeing right now? JIHAN HAFIZ::	Yeah. From where I’m standing right now, I’m at the Sacred Stone Camp, it’s private property owned by Ladonna, which is actually on reservation land. And, what’s being raided today is Oceti Sakowin, it’s the main encampment where water protectors have been for the past six, seven months. It’s sort of in the home of the resistance movement here in North Dakota. We just got word, and now we can see through binoculars, they’re actually arresting people right now at camp. That’d be law enforcement, members of the federal agents, and a number of others, have entered camp and are now staging a number of arrests on the north gate of camp. We’re seeing that there are a number of cops lined up along the ridgeline. I don’t know if you can see that. A lot of the people who are being arrested, are doing it peacefully. They’re allowing the police to arrest them. But the camp has been completely shut off to media. They’re only allowing pooled media, and two video journalists to… written journalists, and one still photographer. So, there is a media blackout for all other media that’s here, all of the press is trying to cover this. We haven’t been allowed in, and we’ve been threatened with arrest if we try to get close. As you know, a number of journalists, the first people to be arrested yesterday, when the initial eviction was to happen, were journalists. So, they’re going after those who are filming and trying to broadcast what’s happening. But as I speak to you, you can probably hear the planes in the sky. These have been roaming around camp, these planes, of the past six months. There are helicopters in the sky. So, there’s a fully militarized operation now, taking place in Oceti Sakowin, to remove, to arrest, the remaining water protectors who are still there. KIM BROWN:	Where are people dispersing to, Jihan? Because last night was the promised eviction time, according to the North Dakota law enforcement, and according to the North Dakota governor. He was planning to evict everyone who was still remaining Wednesday afternoon at two o’clock. That did not happen. As you said, some people self-evacuated. So, where are people going, after they are leaving, or being forced to leave, the encampment area? JIHAN HAFIZ:	Sure. Well, the movement against the Dakota Access Pipeline actually is now national, so you have encampments in Texas, and Florida, and Iowa, all over the country. So, when we knew that this camp… when I knew that this camp was going to get raided, they started a number of different camps surrounding Oceti Sakowin. Just to the east of me, there’s the Black Coupe Camp. On the other side of that, right outside of the Oceti Sakowin, is the Cheyenne River Camp, before that is Rosebud. So, there are a number of different camping locations where people can fall back to. And in preparation for the mass eviction, there were a number of people who moved out there, their sacred items, their personal things, things of value, and they brought them to a number of these different encampments. Also, campers who have been in places like Sacred Stone, where I am for example, have also set up locations where people can sleep, and call home again, because Oceti Sakowin was home to hundreds of people. There was a school there, there was free healthcare, a number of people on the reservation would come down to the camp to get better healthcare than they do on the reservation. You had four or five different kitchens operating, you had a number of different areas where people could sleep, warming zones. So, there was a full-fledged community inside of Oceti Sakowin, before it was raided, and before they gave the February 22nd deadline. So, this is actually, a lot of people have been evicted from their homes today, you know, people who came to Oceti Sakowin. It wasn’t just about a pipeline; it’s also about treaty rights. You have seven bands of the Lakota Sioux tribes here, who are fighting for land that is rightfully theirs, according to documents signed by the U.S. government, the 1868 Fort Laramie Treaty. This is also their land. So, you know, they’re returning back to a lot of traditional ways –- their original ways –- and that’s what Oceti Sakowin represented for a lot of native people who came out here. That’s why they’re holding their ground, and this is a big area, why they’re building more encampments, because this is to them, rightfully their lands, and rightfully their way of life. KIM BROWN:	Jihan, I want to get back to sort of the –- not sort of –- the actual militarized response, that water protectors and protesters have been experiencing at the encampment site, pretty much the duration of the protest, which has been going on for several months now. But what we’re seeing today is a response, replete with Humvees, BearCats, MRAPs –- like I said, we’re also using the stream, or following the stream, from Unicorn Riot, which is also reporting about this as well. So, are we seeing armed law enforcement, or armed militarized individuals trying to force out the remaining people there? As you said… you said that people were being arrested peacefully, but what is the weaponry that you’re seeing out there right now? JIHAN HAFIZ:	Just to give your viewers a backdrop, this camp is under siege for the past six months, so even when the military is not coming in, you have these surveillance airplanes flying around. You have cops that are stationed on top of all the hills surrounding camp. Just like the U.S. military did back in the 1800’s, when they’d surround native camps. KIM BROWN:	Obviously we’re having a little bit of technical difficulties there with Jihan Hafiz. She’s an independent journalist at the Standing Rock encampment site, where a number of protesters are being evicted forcefully by law enforcement, there in North Dakota. Hopefully we’ll be able to get a chance to have her back, and give us more reporting and more details about exactly what’s happening. But this is the encampment site for the Dakota Access Pipeline protesters. They are being forcibly removed. The governor of North Dakota had set an eviction time for Wednesday at 2:00 p.m. That deadline came and went. However, Thursday, today, is when we’re seeing pretty much the promised eviction, forced eviction, that was to come on Wednesday. So, we will certainly keep in touch with Jihan Hafiz out there in North Dakota, and keep you updated right here on The Real News Network. KIM BROWN:	Welcome back to The Real News. We are speaking with journalist Jihan Hafiz. She is live from the Standing Rock encampment site, which is forcefully being evicted by law enforcement and other military agents. Jihan, I wanted to ask how do you compare the militarized response that you’re seeing today on the eviction date compared to how law enforcement has interacted and dealt with protestors and people who were living on the encampment site in the past? JIHAN HAFIZ:	Yeah, well, over the past six months or since this movement started, the response from the authorities has always been heavy-handed. You’re talking about from the dog attacks in September to the water cannons in November to just daily life at camp. I mean, on a regular day, when there’s no eviction or there’s no actions happening, you’re talking about the entire camp being surrounded by law enforcement. You’re talking about 24-hour surveillance. Those planes that are flying overhead constantly harassing people, low-level flying of helicopters. And when they have responded, as you know, there’s been absolutely no discretion of who they’re attacking – men, women or children – or how they’re being injured. They use all kinds of non-lethal weapons lethally. As you know, there was one woman whose arm was half-blown off on November 22nd when they used a sound grenade in a lethal way. There were a number of women who had their eyes shot out, so these are levels of abuse that you see that I saw while covering the Middle East. And how they attack people here is on a different level because they almost always go after the Natives first and people of color first. So, you can see as they’re arresting people and as they’re attacking people, usually the non-Natives or the white allies, they’re not as brutalized as the Natives are. So, the people who are in camp, although I’m not there, there are Humvees going in, there’s a full-fledged militarized operation to go into Oceti Sakowin, which has been a community camp for the past six months, where families lived, where a number of different things were set up for them. So, I wouldn’t be surprised if they were brutalizing people right now out of the way of us in the media being able to document that. 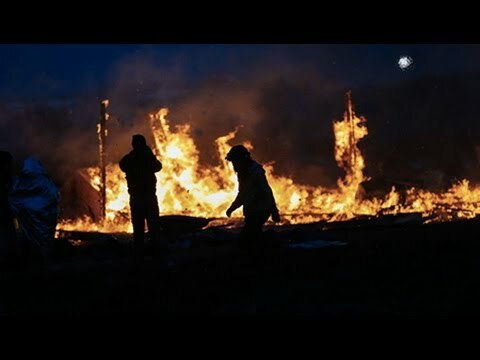 They have created a complete media shutdown in Oceti Sakowin. On top of that, they’ve been targeting media to prevent press members of the media from showing what’s been happening. Just yesterday, Johnny Lee, who is a filmmaker working for… he’s shooting a film with the Sundance Film Institute. He was grabbed right in front of all the journalists. He was one of three journalists to be arrested immediately when they came onto… as soon as they moved forward. So, the level of response from law enforcement, from the military, from the federal agents, has always been violent toward Native people. You’re talking about not just today, not just during the Oceti occupation, but in the history of the United States government. They’re trying to move them off 1868 Fort Laramie territory. There’s a document signed by the U.S. government that allocates and guarantee this land to the Native tribes of this region. So, what they’re doing here is not just a stand against the pipeline and against the desecration of their sacred sites and the pollution of the water, it’s also for their rightfully… their legally… their rightful lands. Land that the U.S. government guaranteed to them in treaties that they signed. So, the stand that they’re making regardless of the brutality that they’re going to face, they’re doing it in honor and they’re doing because it’s something they feel as Native people they have to do to make a stand against what’s happening now as the camp is being raided. There are Humvees that have moved in. I know that you can’t see it but if Unicorn Riot’s doing a live feed, you should be able to see it from them. They’ve come in from the north gate with Humvees. The people that they’re arresting are allowing themselves to be arrested. There’s been no resistance. Nothing’s been on fire today at all at camp. But they’ve been moving in. I wouldn’t be surprised at how they manhandle people, though. Because aside from them attacking people here, once they get on the buses to go to jail, that’s a whole another level of abuse that takes place. Earlier this month when they arrested 76 people, they put 26 of them on a bus to Fargo, which is five hours away. They pulled all the windows down in sub-zero freezing weather and had all the men take off all their clothing except for the low… their long underwear. So, they were driving for five hours in a freezing bus. Some of the got hypothermia and the National Guard was driving this bus. So, those are the abuses they face. People were thrown into dog kennels, refused food or water for 15, 16 hours, were humiliated by taking breathalyzers not because they were arrested for it. There’s no drinking of alcohol at camp, it’s completely banned. A lot of the Native… they weren’t arrested for that but they forced Native people to take breathalyzers. So, you’re talking about brutality that doesn’t just end here at the camp. They’re going to be going through the process at Morton County. I went through it. I was strip-searched when they arrested me. Everyone that goes through Morton County is strip searched or humiliated in some fashion. When I’ve spoken to non-Natives and usually the white allies, they don’t face this kind of abuse that the Natives are facing when these kinds of actions take place. So, it’s quite clear that the targeting is for people of this land and who are trying to make a treaty stand here. And as I mentioned, there are a lot of 90-year-old, 100-year-old grandmothers who refuse to leave based on the fact that that’s their land. So, you can imagine all their lives they’ve been trying to get back to where they belong and now that it’s happening and they’re being removed, it’s quite a traumatic thing for a lot of people. It is a slow process when they evict people. It doesn’t take half an hour, it doesn’t take an hour. It takes hours to evict people. So, the traumatizing and the imagery that’s going through a lot of their minds after being here at camp and after the history of what happened to Native people in this country, it’s a very… it is what it is but that’s what’s happening here. KIM BROWN:	Jihan, can you tell us about the veterans? You talked about non-Native allies and we know that there has been a pretty impressive response from veterans across the country who have come to North Dakota to sort of serve as a buffer zone between the protesters and law enforcement there. What role are they playing today during the eviction? Are they being successful and making sure that people aren’t being hurt by the police that are coming to clear the campsite? JIHAN HAFIZ:	They are serving as a buffer zone but there’s only so much that they can do because the police, the military is going to move anyway. So, what they’re trying to facilitate is that people are not attacked, are not brutalized the way that they have been. They’re trying to create a buffer zone to protect people. Yesterday, when they tried to move into camp, there were a couple of vets that came up and told the police that there are a number of different grandmothers inside the camp, children inside of camp. They can’t just come in and raid when there are families there. So, they tried to negotiate with them to remove some of the grandmothers, which brought us to today. That’s the reason why they’re now coming into camp is because yesterday they weren’t able to come into. So, they have played a role here. I think it’s been a media role, as well. When the media hears the vets are coming, all of a sudden the media focuses again on what’s happening here. So, I think it’s created that platform, as well. As you know, at one point this camp, Oceti Sakowin that’s being raided right now, once hosted 15,000 to 17,000 people in that camp. So, you can imagine the structures that were built, the yurts that came in, the facilities that they opened. There was a construction site, there were medical, there were dozens and dozens of kitchens. So, of course, since they’re not there right now, a lot of them are heading to new protest camps. One’s set up in South Dakota, others in Minnesota, Iowa, Florida, Texas. So, a lot of the people who lived at this camp and were part of this resistance are taking their experience in this resistance and they’re driving directly to the new camping sites. So, they’re not taking a month off to go home or anything. They’re driving directly from one resistance camp to another. That is what’s happening in the state. How it’s going to become what Oceti Sakowin was and what this movement was is yet to be seen. But the fact of the matter is people are completely empowered; not just the Natives, who this is very personal for them. But also the non-Natives who came and stood in solidarity and who helped build these communities. They’re also moving from location-to-location to keep this movement up. Because this was sort of the foreground for the fight against the pipelines and the fight for indigenous rights. There’s lots that was learned here that’s going to be moved on to different camps and a lot of the leaders who set these up are also heading toward those camps. That’s a major reason why they didn’t want the military and the police to come in and bulldoze structures because those are all brand new, usable things that could be transferred to different campsites. When they come in, they bulldoze everything down. You have a functioning medical unit there that people from outside the camp would come and get free medical. That’s being destroyed. The kitchens, which have tons of food in them, fresh food, food that could even be sent for Syrian refugees or other purposes, is all getting demolished and thrown away. So, people here when they were cleaning up, they were trying to recycle to create this new movement to continue what was started here at Oceti in different states. It’s already picking up because they’re on location now, a lot of these camps. KIM BROWN:	We have been joined today by Jihan Hafiz. She is an independent journalist. She has been broadcasting live from North Dakota from the Standing Rock encampment site where law enforcement and military officials are responding to forcefully evict and close out the camp, which has been in place for several months in response to the construction of the Dakota Access Pipeline through contested Sioux and Lakota Indian grounds. We want to thank Jihan Hafiz for her reporting today and thank you for watching The Real News Network.